New product development continues apace at Ferretti Group, which teased three new models during its Miami Yacht Show press conference last week (February 15). 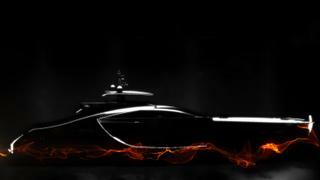 The largest of the trio is the 51.8 metre Pershing 170 (pictured below), which would be the performance yachting brand’s new flagship. Developed by designer Fulvio De Simoni working in close collaboration with the Ferretti Group Engineering Department, this sleek speedster would be built at the yard’s Ancona facility, where the Pershing 140 is currently shaping up ahead of a planned 2018 launch. The hull and superstructure would be built from aluminium and the layout and engine room have already been developed. The Ferretti Group is currently working with two interested clients and a variety of engine installations, but the keel laying is unlikely to take place before 2020. 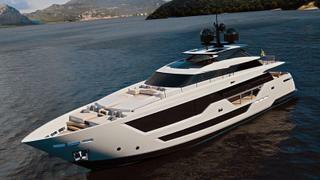 The second new model to be unveiled was the 32.3 metre Custom Line 106 (pictured below). This model was shown in great detail, with a split foredeck seating area, walkaround wheelhouse and cutaway bulwarks allowing plenty of natural light to filter through into the full-height saloon windows. For this project, the Ferretti Group Engineering Department teamed up with Francesco Paszkowski, who helped to work up the Custom Line 120 series — hull number one of which was recently delivered to the Bahamas. Arguably the most powerful name in the Ferretti portfolio is Riva and the heritage brand will also be getting a new model in the form of the Riva 66 Ribelle (pictured below). Styled in collaboration with Officina Italiana Design and due to be built in Sarnico, this 20.1 metre cruiser will boast “unprecedented novelties”, the yard added. No further details are available on any of these designs at this stage, but after introducing 25 new models in the past three years, the Ferretti Group is showing no signs of slowing down.